TEAM TRAD continues to train diligently and has been on the hunt test trail this summer season. Having earned an AKC Junior Hunter Title last summer at age 11 months, TRAD demonstrated a wee bit of talent for the hunt test arena. Now with his first hunting season behind him, TRAD gained much in the way of practical field experience in the hunting of both waterfowl and upland birds. It is our goal to earn TRAD his HRC HUJTING RETRIEVER TITLE and AKC SENIOR HUNTER TITLE, prior to / or by his 2nd birthday on 8/30/15. We are on the way! 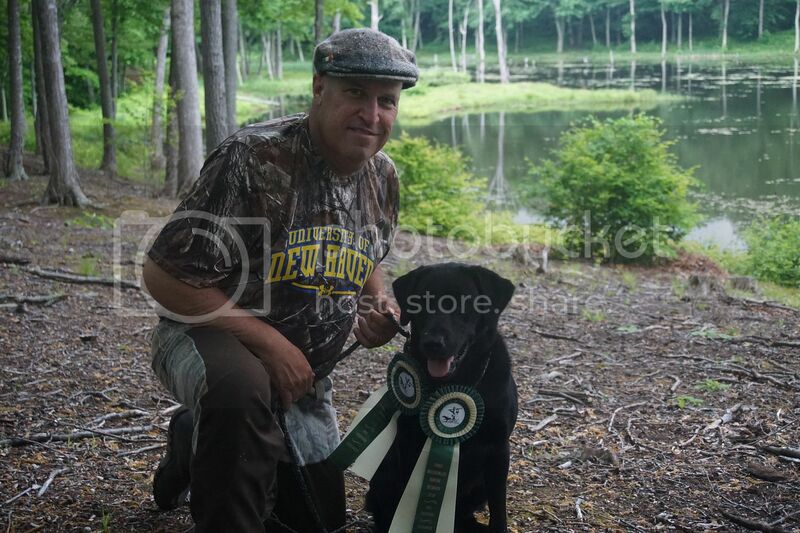 TRAD earned his first two legs toward and HRC HUNTING RETRIEVER TITLE at the HRC double hunt test hosted by the YANKEE WATERFOWLERS HUNTING RETRIEVER CLUB on May 30th & 31st, 2015. TRAD earned his first leg with a qualifying score in the Senior Hunter Stakes of the AKC Licensed Hunt Test hosted by the SHORELINE RETRIEVER CLUB on June 14th, 2015. TEAM TRAD will be in the SEASONED RETRIEVER STAKES of the GRANITE STATE HUNTING RETRIEVER CLUB'S. HRC DOUBLE HUNT TEST in Temple, New Hampshire on June 20th & 21st at the Timberdoodle Club training grounds and we are hopeful of earning TRAD an HR TITLE this weekend. We will also be entering a number of AKC HUNT TESTS this summer, our next will be at the AKC LICENSED HUNT TEST hosted by the SOUTHERN BERSHIRE GOLDEN RETRIEVER CLUB the last weekend in June. For now, it is diligent training daily. Enjoy ye gundogs and good training to ye all! THANKS MATE! We will see what the test brings.